Discussion in 'Jailbreaks and iOS Hacks' started by reznor9, May 4, 2010. 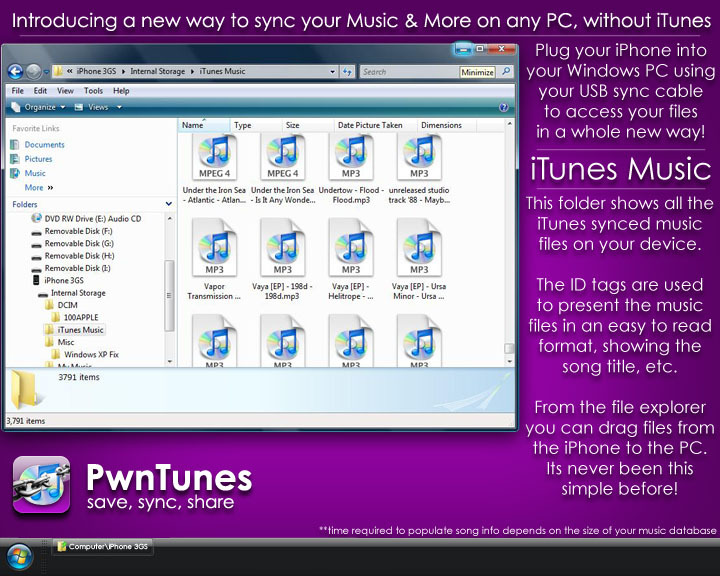 It's a new way to sync your Music & More without the use of iTunes! As we all know there are many many different MP3 players out there but the Apple iPod Touch & iPhone have dominated the market as the best media player around! But even though we all love the device, many of us hate the restrictive iTunes system lockdown on our music and files. Your tied down to syncing your device with only your home PC or you run the risk of losing everything on your iPhone or Touch. Why can't you just plug it into any PC as you can do with just about every other mp3 player in the world!? 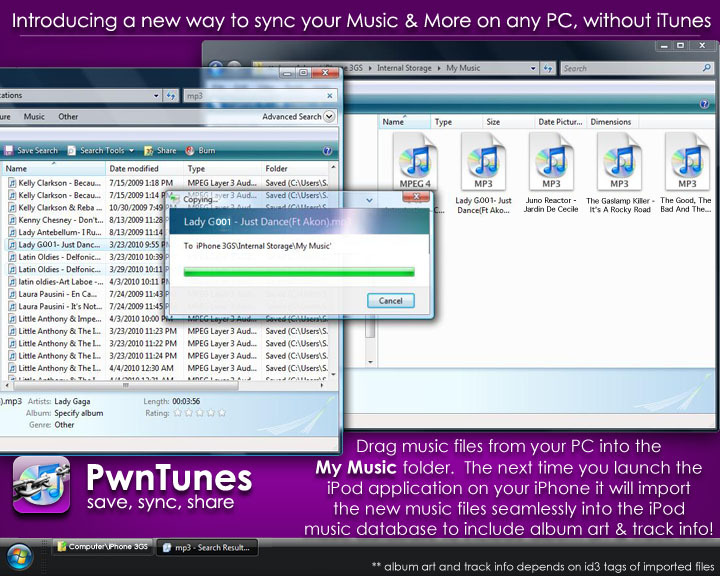 With PwnTunes It's as easy as plugging your sync cable into your Windows PC. Then it's as simple as browsing your file explorer to copy your files from your iPhone/Touch to your PC. or you can drag items from the PC to your iPhone/Touch! 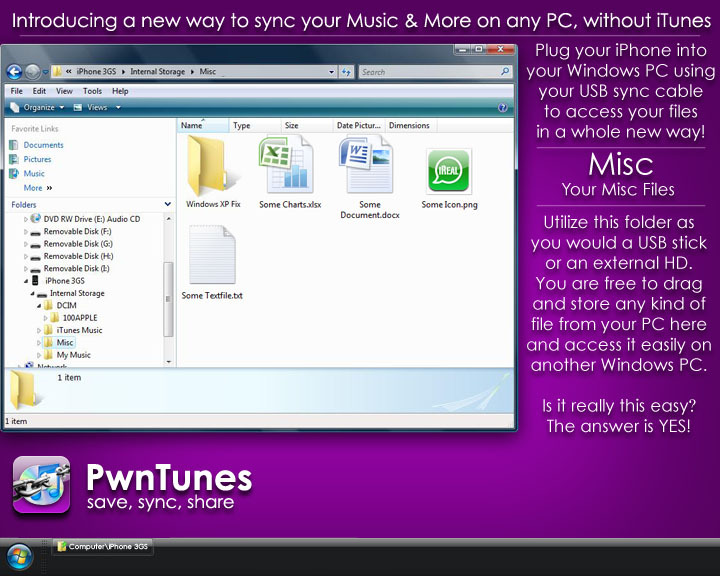 Add music from any PC to your device & it will automatically import into your iPod app. Drag and save any type of file(images, videos, documents, spreadsheets, etc) onto your device to use it as a USB drive! Any plans for a Mac version? Does it require specific software/drivers on the computer or can I just go plug it into any computer and browse it? Can it get access to the root partition? Only xp requires the installation of driver reassignment. And yes you can plug into any pc and gain access to files. But only the ones we have specified. For what the app was designed for. Put it this way. The app has been in production for 6 months. We know for s fact it works. And works very well as we have had a private beta team on it for quite some time. This is actually better worded as a Pre-Release. Granted no new ones are found then this is the official release. And as an added plus Your getting a cheaper rate on the full license. It's better than a free beta that expires then requesting full price right? If your perfectly happy with iTunes then this app is not for you. But if you enjoy the freedom of simply going to any computer... being your friends or your own and dragging music from the file explorer to your iPhone or iPod Touch device and having it easily copy and sync seamlessly to your iPod application... then this is for you. If you have songs on your device that you want to copy over to another computer with the simple drag on drop concept... free of itunes... then this app is for you. if you want to use your iPhone or Touch as a USB flash drive... then this app is for you. if you dont like it... then what can I say... its not for you. I like the idea of using it as a flash drive. What computers would this work on, would it mount as a regular drive? Would it work on mac just for the mounting, or is this just for Vista and 7 as far as the plug and play goes? Can it access the root partition? Will this be available for the 4.0 if it's jailbreakable? I like the idea of using it as a flash drive. What computers would this work on, would it mount as a regular drive? Would it work on mac just for the mounting, or is this just for Vista and 7 as far as the plug and play goes? Can it access the root partition? No access to root. But does act as a USB drive allowing you to drop and save items to misc folder. If purchased via cydia you can use on all your iDevces synced to your cydia account. IPad support should be coming soon as well.